In the beginning of summer The People's Cube participated in a poster contest designed by the Center for Security Policy. Need we mention that we have WON? Our prize was a round trip ticket to Paris, France. Although France may be an interesting place to visit, it was not on our list of priorities. France has already had its revolution and is successfully building socialism, despite temporary setbacks caused by the pro-American shenanigans of Nicolas Sarcozy and his running dog Bernard Kouchner. No, our true priorities are here, in the United States, where Capitalism and individualism still have a strong foothold despite all the progressive efforts by the Party's agents in the media, academia, and the trivial entertainment subdivisions. So we asked the Kommissar at the CFSP to get us two roundtrip tickets to Colorado instead, so that we could pursue our dream of discovering and neutralizing the counter-revolutionary center at Galt's Gulch. Details to follow. Congratulations Red Square! You have done an absolutely magnificent job on these posters and as the soon to be voice of the people I approve! Not only have you won this poster contest you have won the honor of having all of your posters confiscated for use in my Presidential 2008 election run! No you will not receive credit and no you will not receive compensation so don't even ask. You should be happy knowing that your hard work will be used for the Common Good, that in itself should be payment enough!! As a matter of fact I will probably raise your taxes to pay for the mass printing. You can't expect me to reach into my own purse for such expenditures. In my personal opinion (and its the only one that matters by the way) these posters are so well done that they will crush that so called half-black guy and the rest of the dolts running against me. Hopefully with the money I milk from you and the other 300 million in this country I will be able to afford higher quality whores for myself and my husband after I've claimed my rightful throne in the oval office. I fully intend to raise your taxes until we are both satisfied. Congratulations indeed Red Square. Oh how this humble Commissar had hoped to be the first to welcome you back. Verily, this is great news and it has been accompanied by the wonderful news about Putin getting the Red Air Force for Peace flying again, in addition to showing off his physique to show the superiority of socialist diet and exercise. It is great to see you back! Thanks for the report about EADS and their fine work. I had not known of this, but clearly it is good news indeed! -I am hurt that you would choose Galt's Gulch in Colorado. In Wyoming, the belly of the capitalist beast, we have the MX Missile! Comrade Orwell was right. In Wyoming, called "The Equality State" the Bourgeosie Buckaroos here have an upside down definition of equality bred into their disgusting Judeo-Christian Cowboy morality. They are a great threat to our cause and would benefit from your iron boot! -Wyoming also has extensive stores of additional nuclear weapons, SAC bases, uranium, biological and chemical types of WMDs. Abundant Sheep are available for recreation. Unfortunately, other patriots from the motherland have been unsuccessful at counter espionage here. A "family" in the late fifties was arrested taking a photo in front of the first Atlas ICBM missile site in Wyoming. They said they were tourists. The man looked like Commissar Beria. Note: The photographer is deceased and the whereabouts of remains are unknown.Maybe he is someone you know/knew?. The pictures are top-notch, the messages are amazingly accurate and most importantly, they are true. Congratulations Red Square you have outdone yourself yet again! Damn you. You commies are bent on destroying the economy. A "family" in the late fifties was arrested taking a photo in front of the first Atlas ICBM missile site in Wyoming. They said they were tourists. The man looked like Beria. Maybe he was someone you know/knew?. Why, that was you? How well I remember that day. Of course I was but a wee Pup then, but he remembers Papa Beria telling me that those men in the black suits and dark glasses were part of the Amusement Park staff. They were really nice to me, offering me soda and candy, though I couldn't figure out why they were asking so many questions about my father. 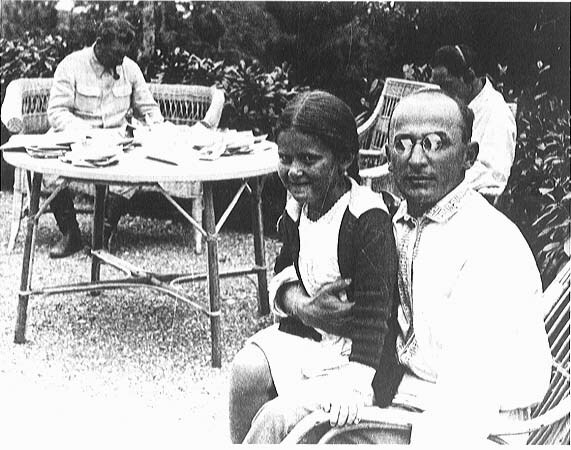 Oh, if only you knew what wonderful memories I have of being bounced on Papa Beria's knees while he was making some important lists in his office. LOL! He used to answer my incessant questions by saying he was really Santa Claus making his lists of Who's Been Naughty and Who's Been Nice. Hmmm... Billary, sweety... can I have your number? You lookin' mighty fine with that butch hair-do and that pantsuit! Mmmm, Mama Nancy is getting a little randy over here! Oh! And Comrade Cowboy... great handler! My goodness, I was so much younger in that picture... what year was that? '56? No, has to be '39 with the way my eyebrow is bowed (had a face lift... well, an early version of the face lift). What the hell is this EADS crap? Did we cook up some new disease to scare folks with and promise them stem cell miracle cures or something? I don't remember getting a memo about this!? WHY DIDN'T I GET A MEMO ABOUT THIS!? Meow, where is my memo?!?! OHHHHHH... OKAY! EADS is a new waxing spread for my over grown bikini line.... gotcha. Theocritus, sweety, come over here and spread some EADS on my bikini line... Mama Nancy has to look good for Hillary this week and the bush hog isn't working. Hurry up, dear... Mama Nancy has a lot to do and it will take at least 48 hours to cut your way through the protected wet lands I've got down there. Nancy dear, don't you worry your gorgeous shrink-wrapped face off. When I become queen err, I mean President of this country you will have a direct line and unfettered access to the oval office and any other room you'd like to get intimately acquainted (and I do mean any). Your picture is having this odd effect on Commissar Pupovich. He is torn between lighting a cigar, fondling any creature in sight, lying about it all, and retching. Quite exciting I might add! The only effect I get is a strange urge to tear my eyes out with a rusty spoon. Ah, I see... I thought it would be like the glorious Hollywierd Movie "Robin Hood". Not the fascists older one which valued English pride, honor, and other things progressives lament; but the Kevin Costner version which rightfully shows English as fools and the wise Islamist as the true brains and culture. "Because it will hurt more!" We have a spoon shortage here in my district. Seems we have not got the expected deliveries from the shovel factory in a certain comrade, who was perhaps too busy with his falcons, and the beets must be harvested. I get tired of stepping in the Doggie doodles left by the ankle biters, and it dulls my shovel having to get rid of the waste. Have you no concern for the poor and jobless comrade? Why would you deprive those who have no job a chance to work? The closest you come to a shovel should be deciding what model you wish your proles to use. Well excuse me far my Teaxes' Twang. I am tryink to get rid of my twang as well. Since I no longer live in the Socialist Republik of Austinski. I have moved to a rural lifestyle digging my bunker for the coming revolution. Commissar Pupovich, how foolish of me, we of course should have a prol cleaning crew to clean the mess left from the falcons and condors. Ah yes "Arbeit Macht Frei"
While I appreciate that you took my gentle earlier correction properly, I see we still have... no, work would not be the word... some grooming to do with you. "I have moved to a rural lifestyle digging my bunker for the coming revolution." Now if you are so insistent on digging comrade, I will be happy to oblige you. As my latest purge has been so successful, I do have plenty of career opportunities available for you if you continue to insist on digging yourself. Commisar, My back yard is actually quite the Diggathon. As I have recruited 5 bassetts, and a Blood Hound (for tracking down infidel... er useful idio..... er proles) There is little to do but supervise. Hmmm, as the Mighty Pup, the Pup is compelled to inquire whether the noble creatures of yours are doing this for their amusement. We're not talking about useless poodles or those falcon bait rat dogs. And one must also wonder if it is wise to waste the talent of a good blood hound that could ve used to track down infidels and thought criminals. The Commissar did consider that you were indeed talking about a project that you were supervising, but I also felt I should point out that one must be careful in the way you communicate so that others do not mistakenly get the idea that you were indeed handling a shovel. Correct Party Protocol is more important than objective facts, for facts are only as real as the next memo allows them to be, but Party Protocol is eternal, until revised of course.